K-9 Units The Crawford County Sheriff’s Office took a different approach to a K-9 Unit back in 1995. Under the direction of former Sheriff Ronny Shawber, Lt. Tim Mutchler obtained a bloodhound and both became certified in man trailing. Lt. Mutchler’s current K-9 is Ajax. In 2004, Deputy Jeff Windbigler would also obtain a bloodhound and join the K-9 Unit. Windbigler’s current K-9 is Tucker. Both deputies and K-9 are members of the National Police Bloodhound Association. Lt. Mutchler and Deputy Windbigler both attend yearly training with their K-9 and receive certification from the N.P.B.A. Lt. Mutchler is also an instructor for the association. The bloodhounds have been used for tracking suspects who fled from a crime scene, to searching for missing children and individuals with Alzheimer’s. This resource is made available to all law enforcement in Crawford County, and have been requested in other parts of the state as well. Both handlers have given presentations at different events throughout the year to several different groups. 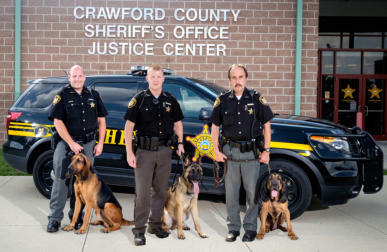 A third K-9 was added by Sheriff Scott Kent in 2015. 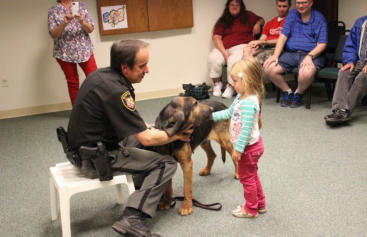 Deputy Brian Wozniak was able to obtain his K-9 through donations. Rex is a male Belgian Malinois imported from Czechoslovakia. Rex is certified in Narcotic Detection and Tracking. He has been with the Crawford County Sheriff’s Office since Aug. 2015. Deputy Wozniak and Rex both received their training at Gold Shield Canine in Columbus Ohio. Deputy Wozniak and Rex are available to other Deputies during traffic stops, and Rex is used to search the jail housing areas and local schools for narcotics.